Auto body sheet, horns, metal. Installation consisting of a TV set, its screen acting as the surface for an abstract geometric composition made with adhesive tape. A painted piece of pottery surmounted by an indoor TV aerial is set on the television. Television set, painted pottery, TV aerial, adhesive, metal plastic, small stickers. 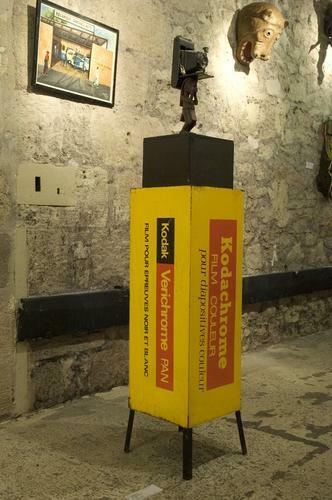 Assemblage of 3 elements made up of a Kodak brand metal advertising post acting as the support for a painted wooden stand on which is fixed a statuette associated with a Kodak camera. 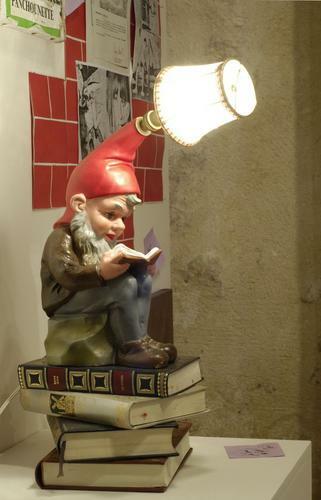 Plastic garden gnome placed on 4 books, their hats ending in a small bedside lamp which lights up. Plastic garden gnome, electric light bulb, lampshade, books. Active from 1969 to 1990, the Présence Panchounette group (made up of Frédéric Roux, Jean-Yves Gros, Michel Ferrière, Pierre Cocrelle et al…) started to make a name for itself through actions, tracts and “performances” where there was a mix of wit and protest, peculiar to that post-’68 period. In no time their critical work would focus on challenging modernism in its minimal and conceptual forms on the 1970s. Anticipating the Appropriationsim of the 1980s, the Panchounettes introduced vernacular and decorative references, and “other” perforce “impure” cultures, so as to renegotiate and broaden the avant-garde notion. The group broke up in 1990, when its work had just been shown in a major show at the CNAP in Paris. Following the retrospective held by the CAPC, it thus seems natural that this institution should become the holder of a coherent selection of wall pieces which retrace an overview of their work from 1972 to 1990.